Happy Halloween! I have been seeing so many fun Halloween photos on Instagram and Blogland. It seems everyone is planning on having a lot of fun getting dressed up and having a good time today. I don't plan on doing anything special today, unless you count hiding inside a dark house so the trick-or-treaters think no one is home. But don't worry. I did have my husband buy a bag of Reese's in case they find me out! I did buy candy and gifts, and I made a card for my adult children. They just texted me today to tell me thank you, so now it's safe to post my Halloween projects since I know they received them. First up, a scary card! This was a pre-cut card that I bought in a package of 6 or 8 years ago. It's just plain white card stock and you can color or decorate it as you wish. One year, I colored the card. This year I decided to try glitter. What a disaster. It was a reminder to me of how much I hate working with glitter. I sprayed the entire card with adhesive spray, but the glitter did not want to stick to all of it evenly. Rather than throw the card away, I went with it. I just colored in the bare sections with a marker. It made it look more spooky that way. The only other thing I did was add a scary felt pumpkin to the front of the card. I put the pumpkin over a black, scallop card base to make it pop more. I sent my kids a box filled with different kinds of Halloween candy. But most of what was in the box was for my son Jordan...who loves candy. Ashley doesn't eat candy at all so I bought her this pretty journal instead. Ashley loves peacocks so I knew she would love this journal. I wrapped the journal with autumn paper from DCWV. The front has a floral pattern on it, and the back is a coordinating solid. 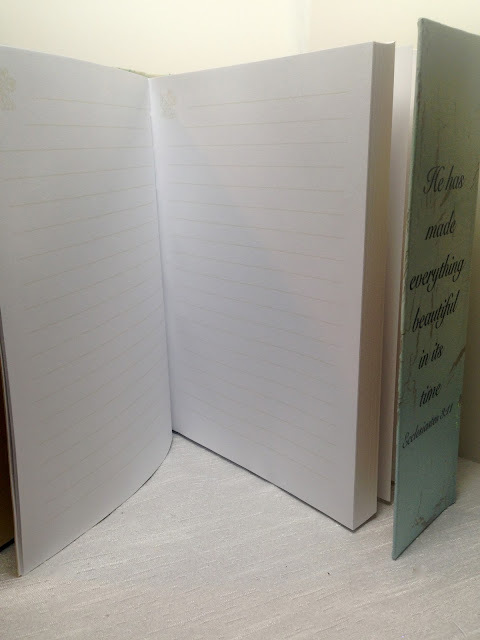 I just laid the book on the paper and scored around it, creating a flap with the solid paper. 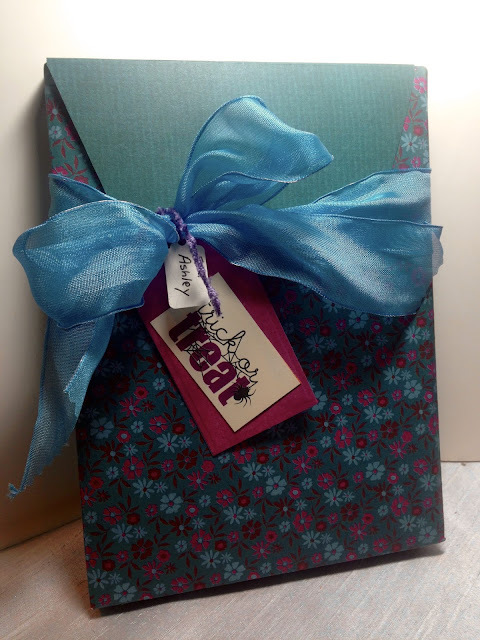 I then tied a bow around the book with a pretty ribbon and added a couple of tags. The little tag was cut with a Martha Stewart Punch and then tied onto the ribbon with a purple piece of fiber. 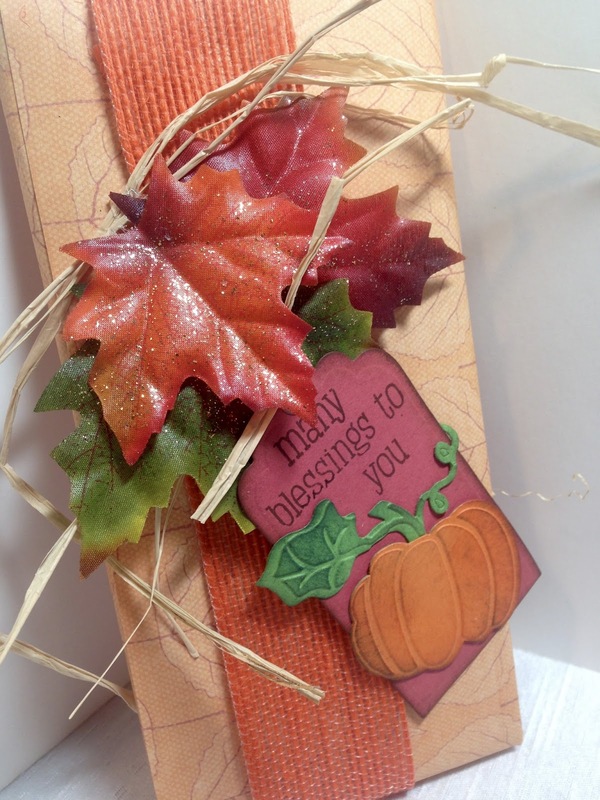 The bigger tag was made with a Nestie, then I used a sentiment from a Halloween paper stack to attach to the tag. 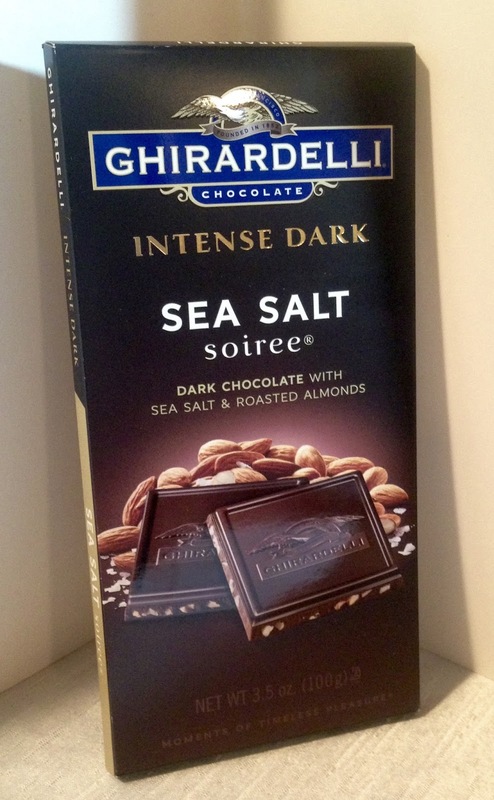 My son-in-law Jason likes candy, but doesn't eat quite as much as Jordan does, so I sent him just two items. I wrapped them up using autumn paper from the same DCWV stack. Here's the candy bar before I wrapped it. And here it is wrapped. 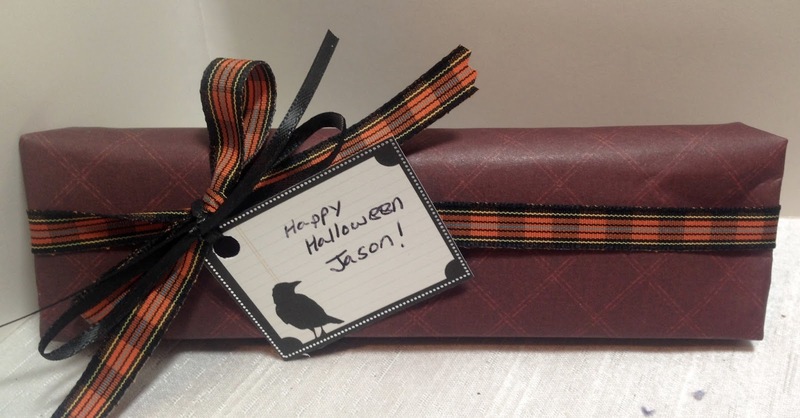 Again, I just wrapped fall designer paper around the bar, then I added a ribbon. Raffia and fake leaves were then attached. 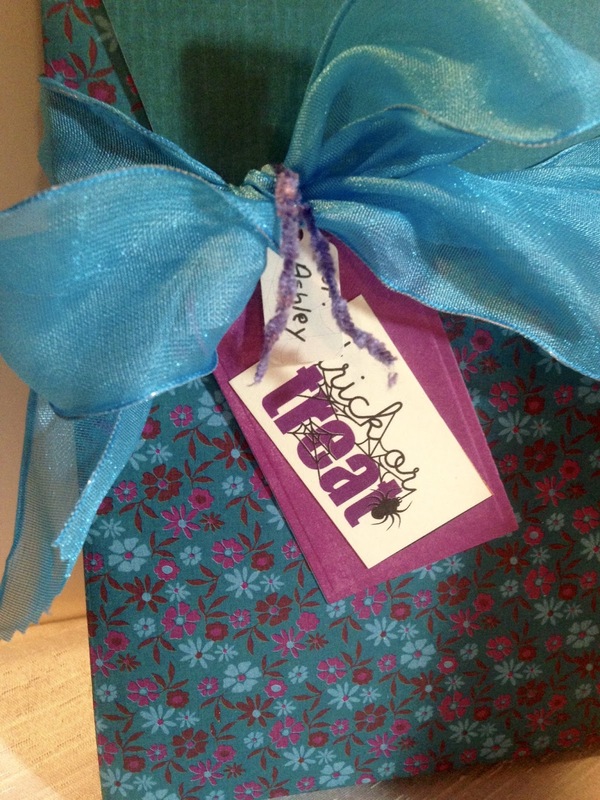 The tag was cut with the same Spellbinder's Nestability I used on Ashley's gift. 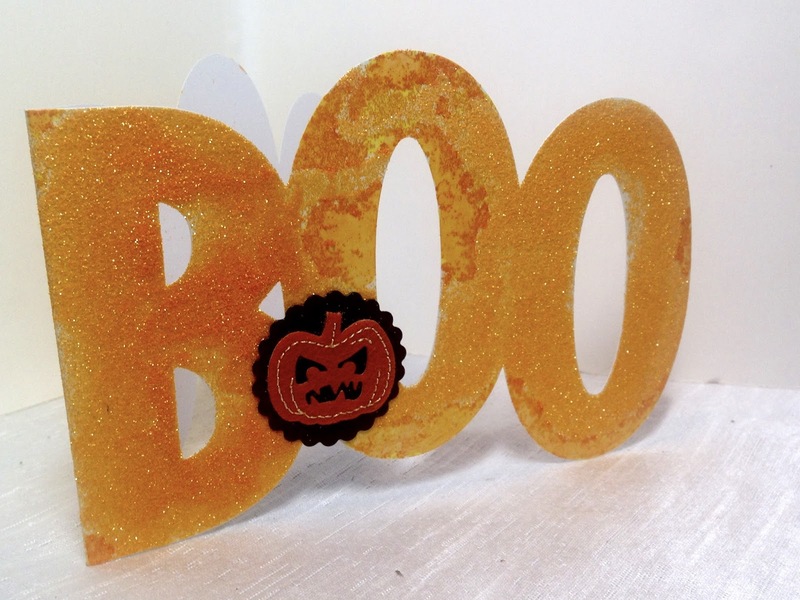 The pumpkin was made with a CuttleBug Die. A sentiment was stamped directly on the tag. 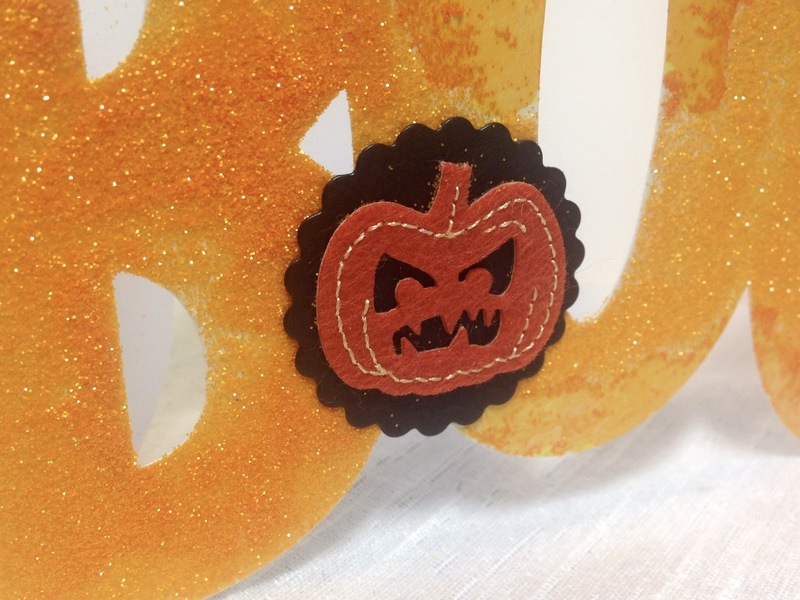 I sponged ink onto the edges of the tag and onto the pumpkin to make everything pop more. And finally, what would Halloween be without Reese's Peanut Butter Pumpkins???? But of course, a little presentation makes everything more special. All I did was wrap the bar like a present, but I used fall designer paper instead of gift wrapping paper. I added some Halloween ribbon and I hand cut a tag from a Halloween paper stack. I attached the tag to the ribbon with a separate piece of black ribbon. I recently had to travel to Champaign, Illinois to chauffeur my daughter around for a few days and attend a performance of hers. I had such a difficult time packing for this trip. I wasn't entirely sure what I would be doing most of the time, and because my destination was eight hours south of where I live, it was much warmer! 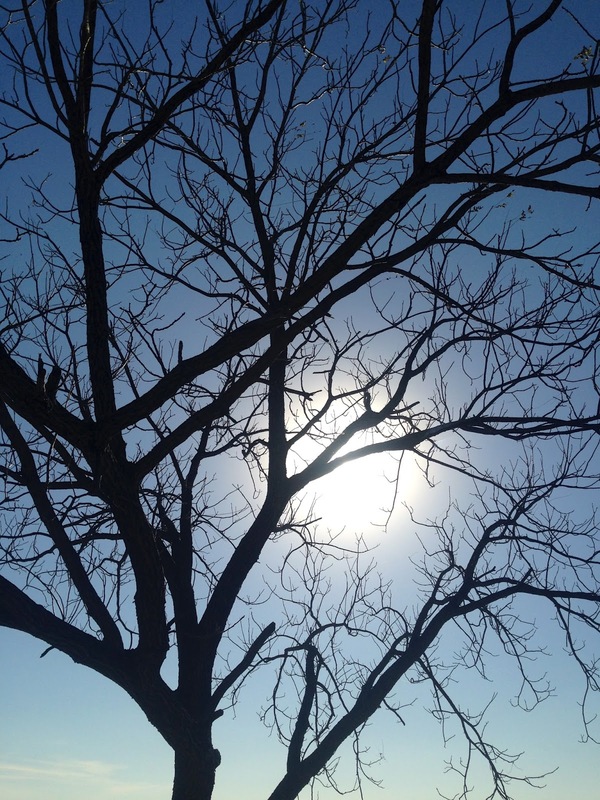 My mind was already set for cooler fall temperatures, and I had a hard time reconfiguring it for temps in the high seventies. I was kind of bummed actually. I usually would be thrilled to be in warmer weather, but I had so many cute, new, fall items I wanted to wear! 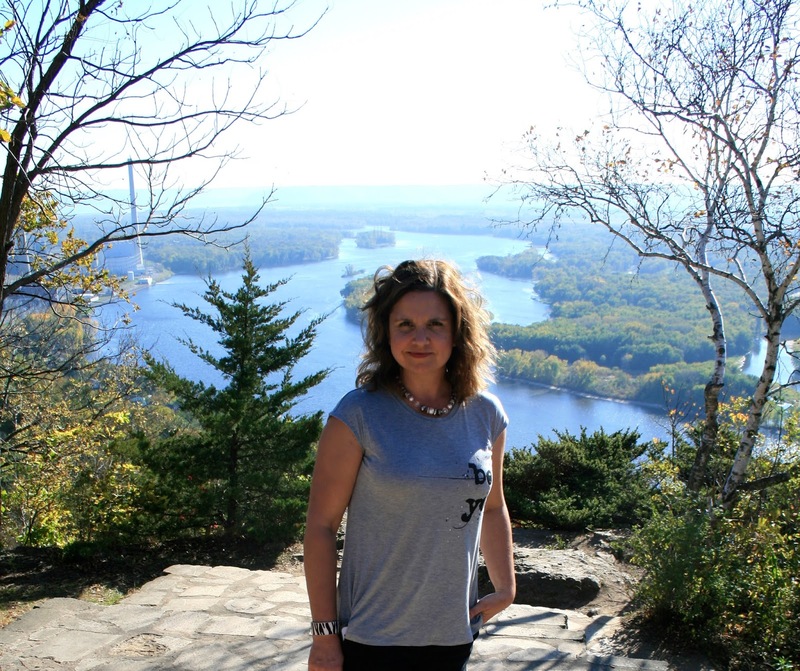 Even though I knew I would be in summer-like weather (well... summer like for a Wisconsin gal! ), I still wanted to look like I was dressed for fall. So I decided on a short sleeve sweater outfit! This sweater is super old. I purchased it at Kohls, and have had it for sale on my Poshmark store for awhile now. It's still there if your interested in it! 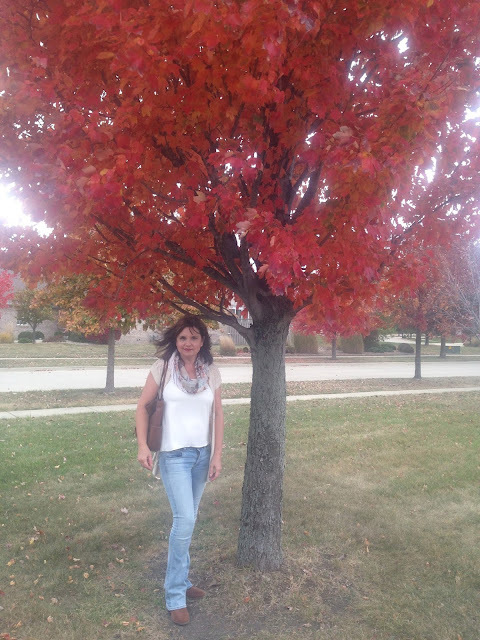 It would be perfect for the Southern gal who wants a fall look but lives in a warmer climate! I love this sweater, but for my Northern lifestyle, the short sleeves are impractical. I have worn a thin, clingy long sleeve top under it on occasion. On this 77 degree day, this sweater was perfect! It gave me the fall look I was going for, but I stayed comfortably cool. Underneath the sweater I wore a camisole from Express. This entire outfit reminds me of another look I wore not too long ago on a trip to the twin cities. You can see that look HERE. I'm wearing the same pair of jeans and carrying the same handbag, but everything else I have on is different. The colors and style are very similar, and the long sleeve cardigan is far more suitable for my climate. I chose to wear a light weight, gauze and cotton infinity scarf to accessorize my outfit. I had a necklace ready to wear too in case it got too warm for a scarf, but I ended up keeping the scarf on all day. Even though the temps were warm, it was very windy which kept me quite comfortable. 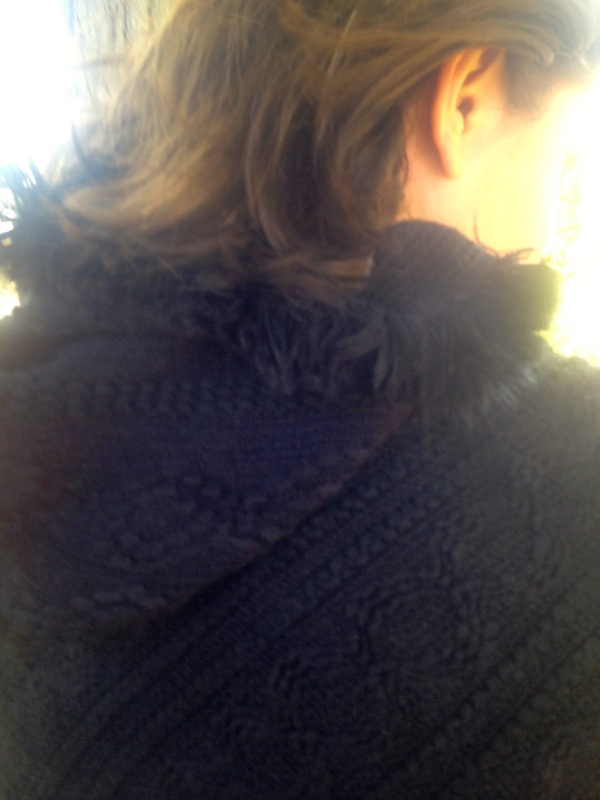 The sweater has an open weave, so you will see whatever your wearing underneath from the back too! The sleeves are rolled up and there is a button lapel. The cardigan falls about six to eight inches below my hip; so not quite as long as my new one shown in my previous post. Here is a detail shot of the button lapel. 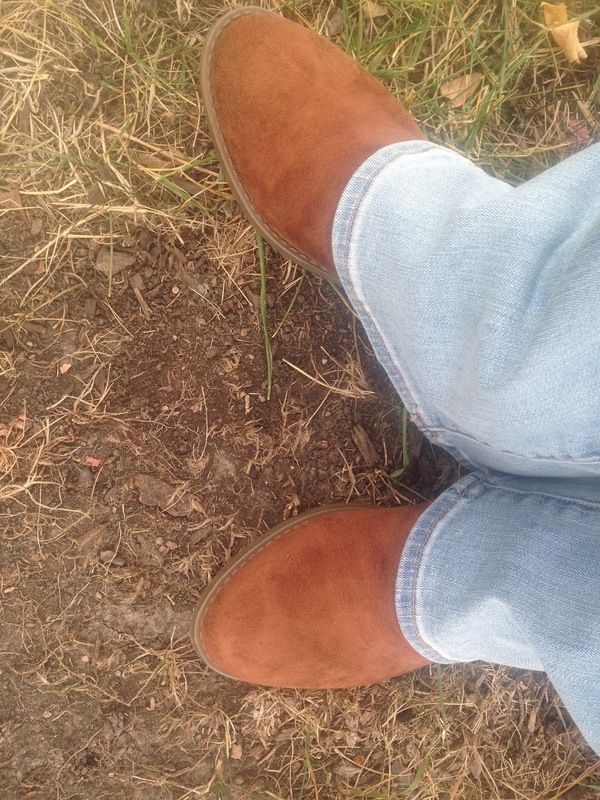 I did get new suede booties, but only because I paid $7.67 for them. Yes, you heard me right! $7.67! They were $60.00 shoes, but they were on sale for $41.99, then I used a gift card I received from a survey I won, then I had a coupon, and by the time all the deductions were taken off, $7.67 is all I had to pay! Yippee! 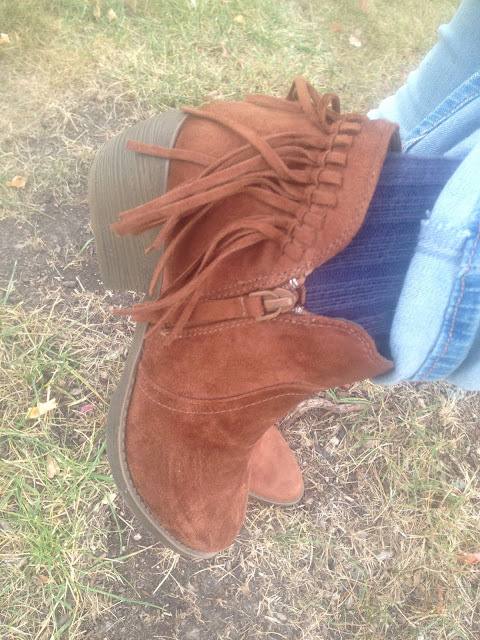 The booties have a cute fringe detail on the ankle. I wore these walking around the Champaign/Urbana campus all day and my feet never hurt. They are so comfortable! I love all the flare jeans in style right now, but I do regret that the flare always covers up my cute shoes! I had to roll up the cuff just to take a picture of these fun booties for you! If your interested in these shoes, they are available at J.C. Penney HERE. It turned out my short sleeve cardigan was the perfect fall look for a warm fall day. And since most of the day was either spent in the car, walking around campus, or in a coffee shop…I was appropriately dressed for the occasion! What was I so worried about anyway? 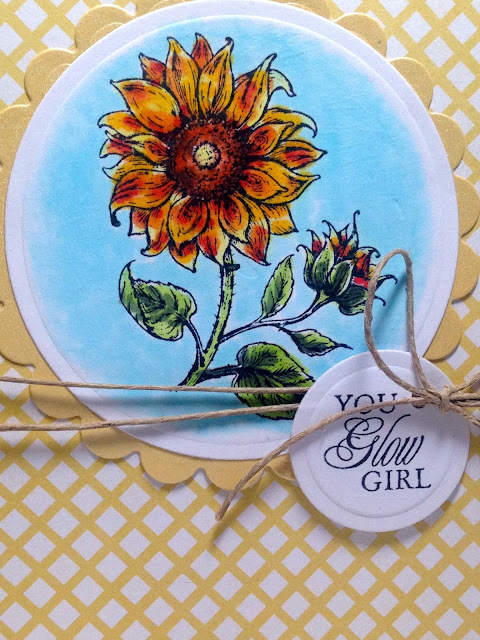 Since it is fall, I decided to use a sunflower image from Flourishes "Sunflowers" set to make a birthday card and an anniversary card. 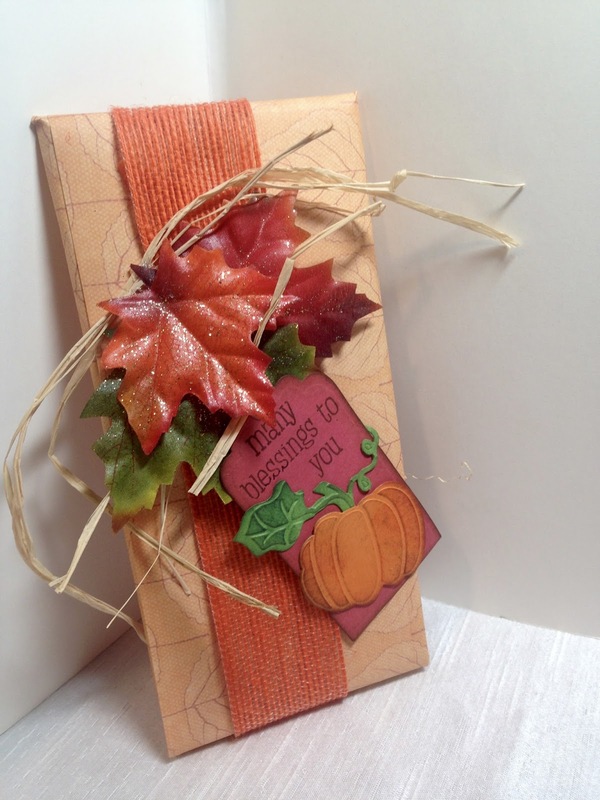 The happy events are in the fall, so why not make the cards with fall colors and images? I started by being inspired by a card by Debbie Olson HERE. I used her design, and just changed out the stamp and papers. Although, I found it interesting that her stamp and mine were so similar I had a hard time finding the difference. The papers are from DCWV "The Lemon Flower" Mat stack and Card Stack. 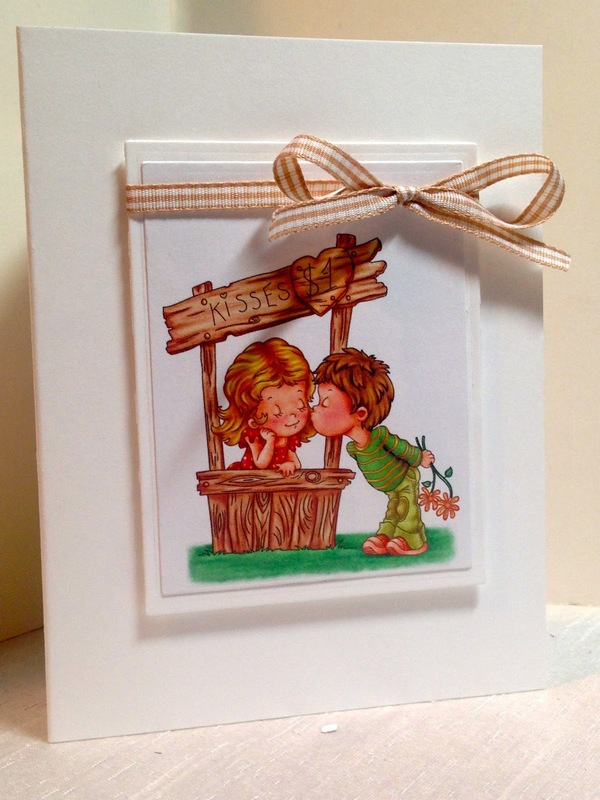 I stamped the sentiment onto a tag cut with Spellbinders Nestabilities. All the other shapes were cut with Spellbinders as well. 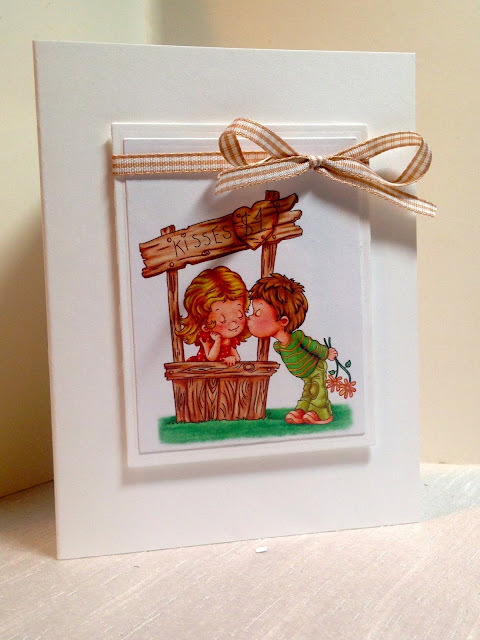 I popped up the sentiment tag with dimensionals and then wrapped some hemp cord around the card. I rounded the edges with a corner rounder. My next card was for a fall anniversary. I used paper from DCWV "Amber Autumn" and "Pumpkin Pie". Again, all the shapes were cut with Spellbinder's Nestabilities, and I wrapped hemp around the card base for embellishment. 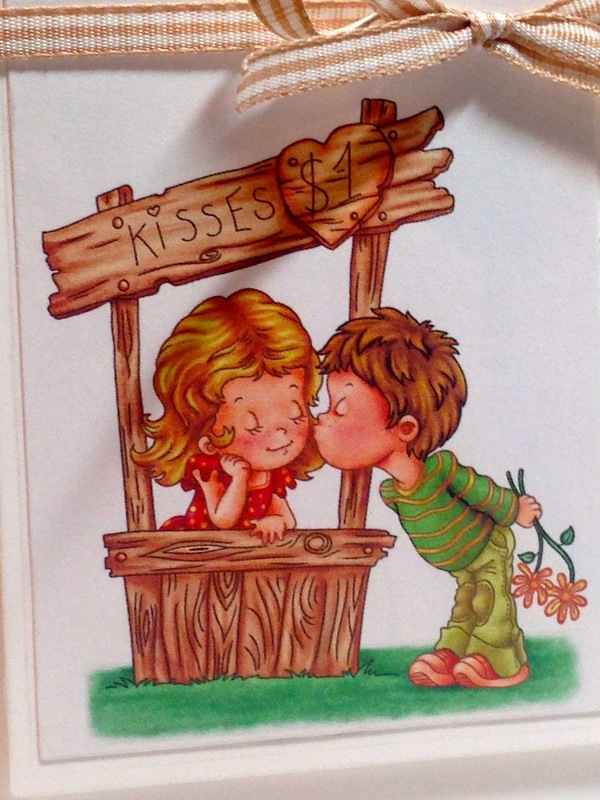 Since Anniversary cards are for the guys as well as the girls, I don't like to make them too feminine. Buena Vista Park is a scenic overlook located in Alma, Wisconsin. I live only about a twenty minute drive to this park, so I have been here about half a dozen times. It's always one of the places I take out- of-town company to see. No matter how many times I stop and take in the view, I am always awestruck when I see it again. 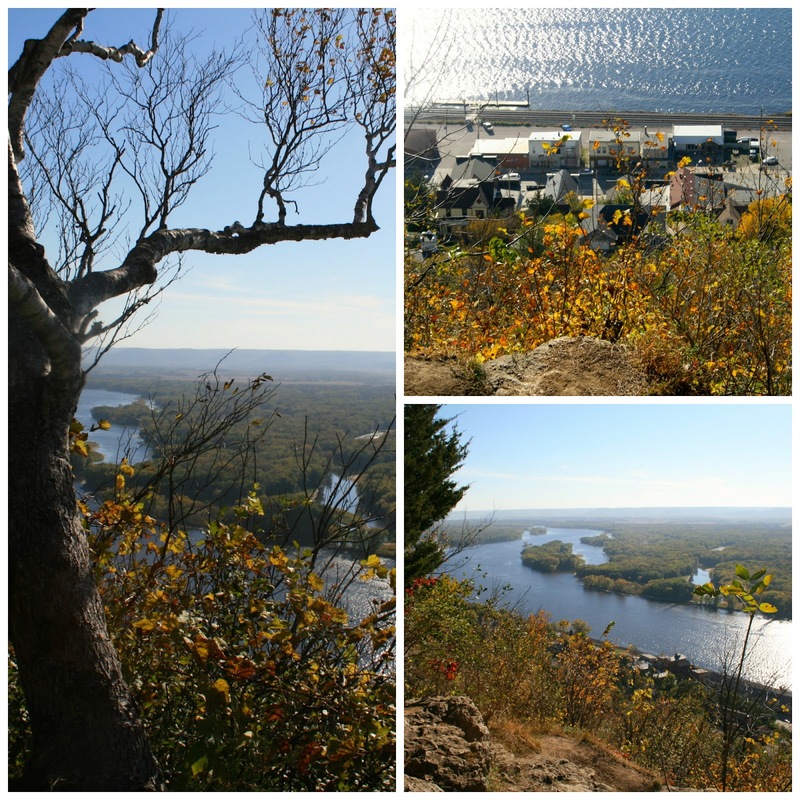 On this day, my husband and I took a drive to Merrick State Park to enjoy a hike in the woods and enjoy the fall colors. 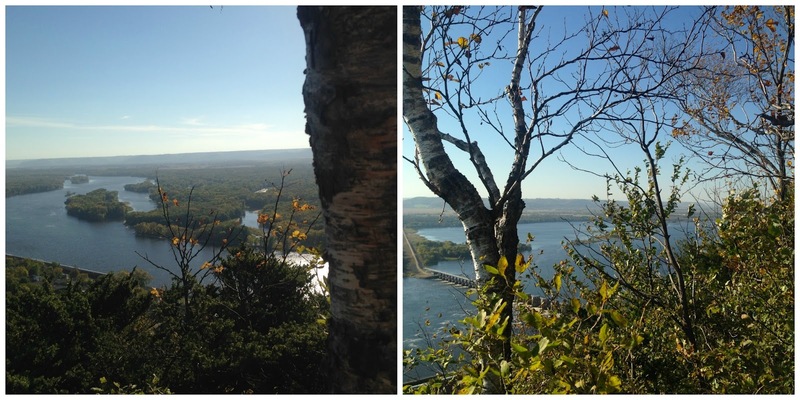 Buena Vista Park was nearby, so after our hike we decided to see the fall colors from the scenic overlook. The park has a long, winding road up to the top. It can be kinda scary if your afraid of heights, but it isn't as horrible as mountain roads like Pike's Peak or Mt. Washington of course. You can also hike your way up or down. The park is known for it's amazing view of the Mississippi River. Visitors can watch barges traveling up the river and locking through the dams, along with views of the sand islands and backwater areas. I always enjoy looking straight down and seeing the little town of Alma below. It reminds me of a miniature train village when seen from that height. Especially when a train comes through like in the lower left picture above. Everyone that comes to this park comes to see the view. There is a nice lawn and tree filled area to picnic, and we did a lot of people enjoying it on this beautiful eighty degree fall day. This is a Lock and Dam #4. You can walk across a bridge and get an up close view of the dam if you wish. I think we did it one time, but because two of my biggest fears are heights and water, I wasn't thrilled with the experience. 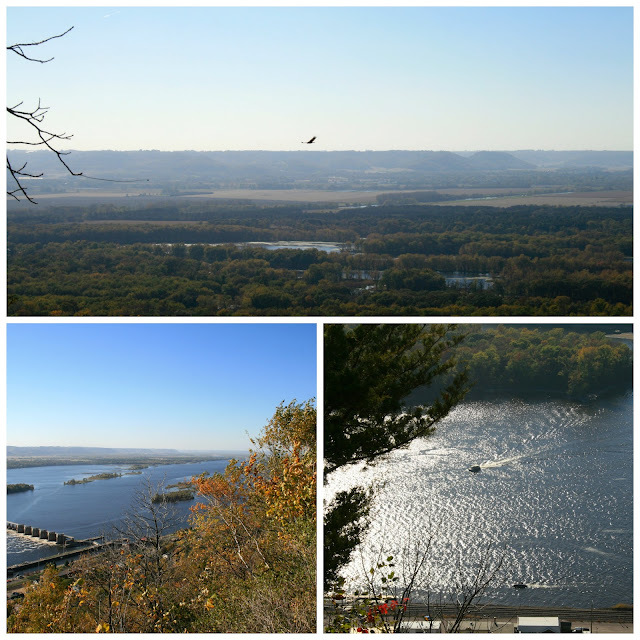 There are large birds that fly in the sky above the Mississippi that provide a lot of entertainment to the sight-seekers. I believe this is a turkey vulture, but it is also quite common to see Eagles in this area as well. It was a little early for fall color, so the colors weren't as vibrant as we hoped, but it was still pretty. That is a power plant pictured below. Whenever we travel, my husband is usually the photographer. He likes to use the DSLR, and I don't like to carry it, so I happily give the job to him. That's why so many of our travel photos are of me. I do however take my own pictures as well, but I use my IPhone. He always worries me because he takes risks I would never take to get the perfect photo: like climbing on the edge of cliffs! I have learned I can't even watch him when he is doing something risky, and I have to just turn and walk away or I'll have a heart attack. No matter how many times I ask him not to do something dangerous, he does it anyway. He always insists he is perfectly safe. So I give up. This is a photo I took with my IPhone. I love the way it turned it turned out. I had to travel out of town for four days, and right before I had to leave I realized I needed to pop an anniversary card in the mail. I had zero time to make a card, so when I saw this pre-printed digital stamp sitting on my desk, I knew it would be perfect. All I did was cut it out with Spellbinder's Nestabilities. I then mounted it on a second white frame, and popped that up on dimensionals onto a white card base. 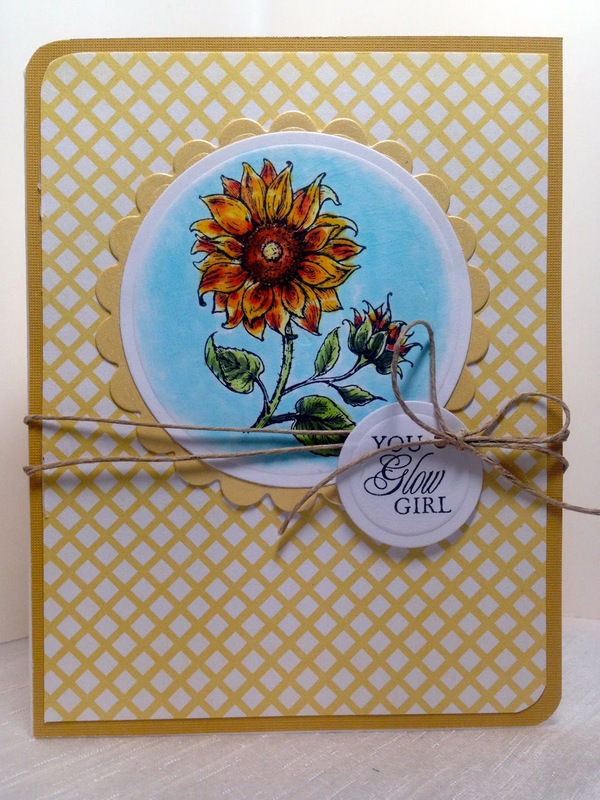 I tied a brown gingham ribbon around the image base for embellishment. This card would have looked un-done or too simple if I wouldn't have added the extra details of the dimension and the ribbon. Just adding one or two elements to a clean and simple card can make all the difference in the world. A few years ago I bought a poncho and I wore it once or twice then I gave it away. I just didn't like the way it looked on me; the heavy, thick knit added a lot of pounds to my frame. I also felt it was very impractical in my climate. I couldn't wear it under a coat (trust me, I tried), and it was too cold most of the year to wear it without a coat. Plus, I felt my movements were greatly restricted in a poncho. So trendy or not, out it went. Then they came back into style big time this season. I asked myself, do I really want to go there again? I mean, I love the way they look on everyone else, but they look horrible on me and they don't work for my lifestyle. Well then Stitch Fix sent me a square poncho (shown HERE), and I loved it! It looked great, I could wear a coat over it, and I felt I had plenty of arm movement. I then realized it was because the knit was thin, and it had armholes. 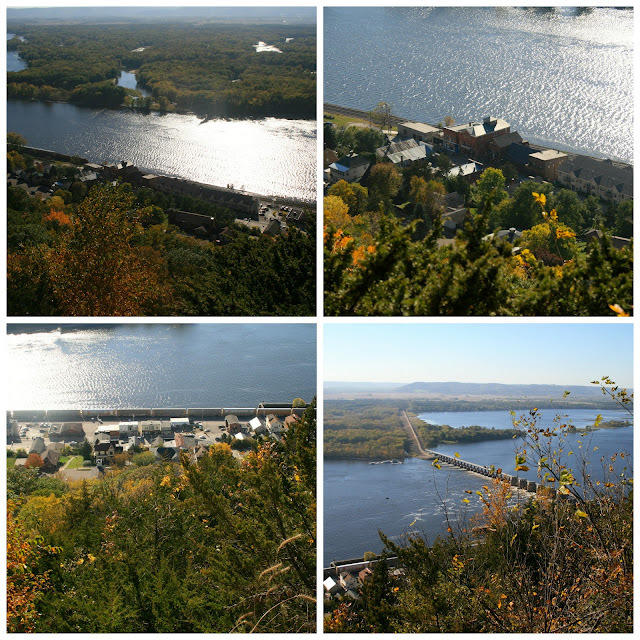 Later that week, my husband and I were visiting the cute little town of Wabasha, MN (see THIS POST), and we stopped in a little boutique where they had a ton of ponchos and wraps for only $25.00 a piece! My husband graciously told me to pick one out for myself, (and it was hard, for they were all so pretty and there were so many different colors and styles). I decided on this black one because I thought it would go with anything in my closet and it had a hood! I've never seen a hood on a poncho before. The poncho is very thin and somewhat see-thru. It is also very long. I believe the reason this poncho works for me and my old one did not, is because the thin yarn does not add extra bulk and the length elongates the torso. The hood has a little soft, furry trim. It is also asymmetrical and has a fringe on the edge. The hood is not very deep, it barely frames my face. But it covers my ears enough to keep them warm if needed. 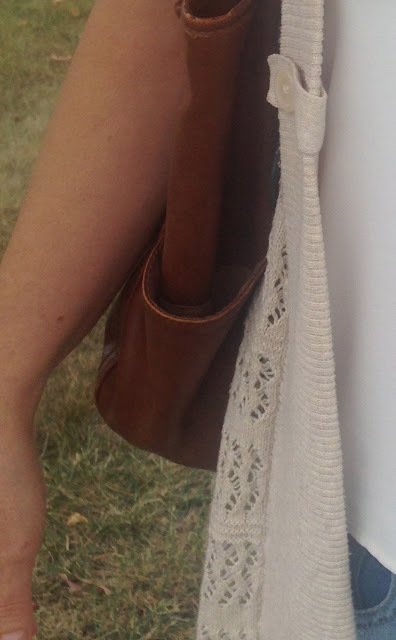 I gave you a hint of this outfit and poncho in my Stitch Fix post last Friday. But since that post was all about my Fix, I wanted to do a separate post about the poncho. 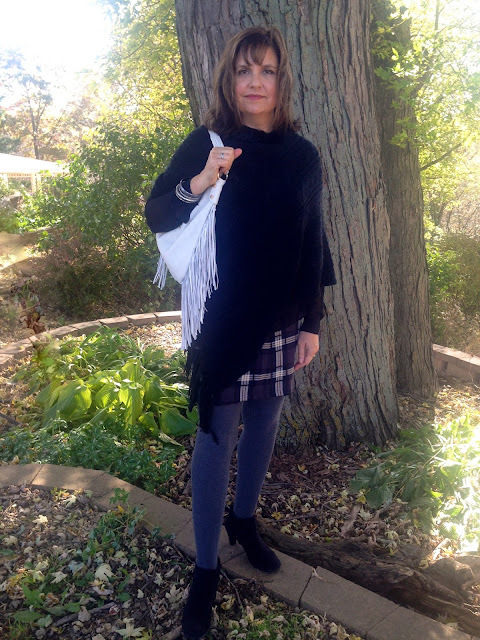 I wore my poncho with this plaid skirt that Stitch Fix sent me and a Michael Kors tunic. I initially was going to wear the poncho as outwear, but I ended up leaving it on inside as well because it was so cozy, warm, and comfortable. I felt like I was snug in a blanket and I loved it! For jewelry, I only wore silver bracelets and my usual rings since the poncho went right up to my neckline. In case you missed Friday's Fashion Post, this is the outfit I wore under the poncho. I wore grey, cable knit tights on my legs, and suede booties on my feet (old, Famous Footwear). Stitch Fix also sent me a fabulous fringe hand bag in my Fall Fix. My experience with ponchos taught me a valuable fashion lesson: If a trend doesn't initially work for you, try different styles till you find one that is right for you! Ponchos come in all shapes, styles, and materials. I learned that the short, thick and chunky ponchos do not work for my body type; but the thin, long, asymmetrical ones do! So what about you? 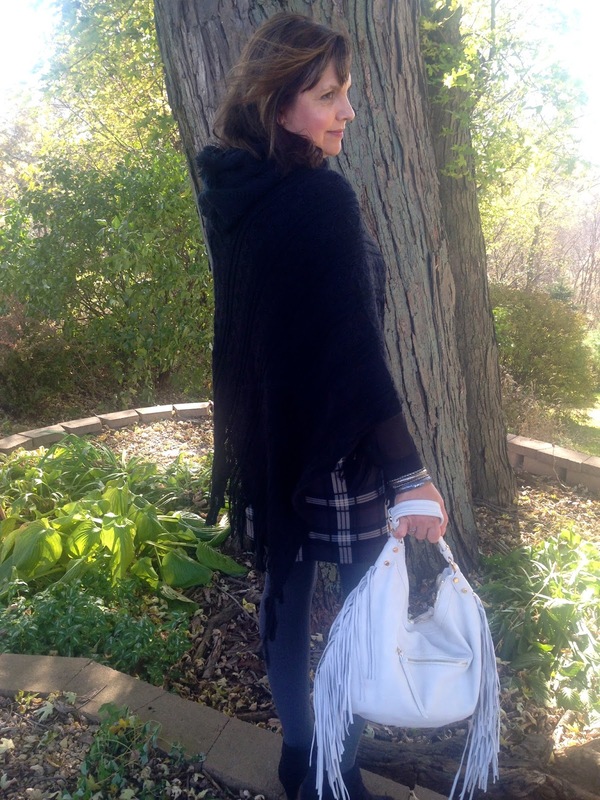 Have you purchased a poncho yet? I'd love to hear from you!